You'll experience campaign success a-"round" the clock with the KOOZIE(R) round coaster! In our best-selling KOOZIE(R) material, this round-shaped coaster is constructed of 3 millimeter thick foam with a polyester back. 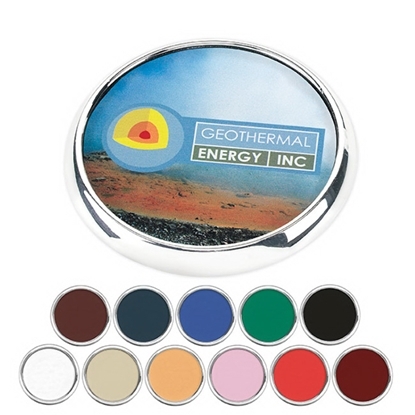 Made in the USA, this fantastic giveaway measures 3 3/4" diameter. It's perfect for promoting your brand on any occasion or at any event. Have your logo or message imprinted on yours today! You'll spread your campaign message from "coast to coast" with the round coaster! 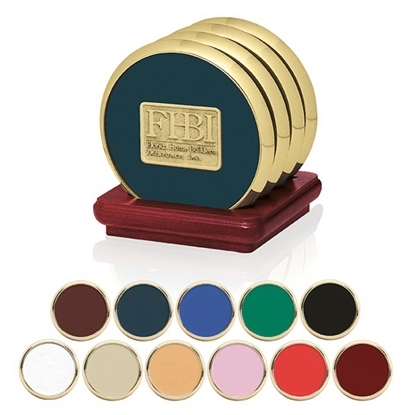 Made of bonded leather, this slide and water-resistant, round coaster has urethane coating to resist staining. Offering furniture protection plus a wonderful promotion in one, this giveaway is a product that anyone can use. Great for the home or office, it's perfect for promoting your brand with your imprinted logo or message. Order yours to capitalize now! 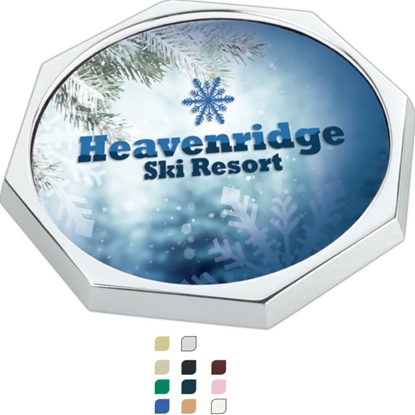 Octagon shaped zinc alloy coaster features a full color imprint with bleed that is decorated on white leather. Please specify leather color and coaster finish when ordering. Revel in your choices with our Radiant Leather Coaster! 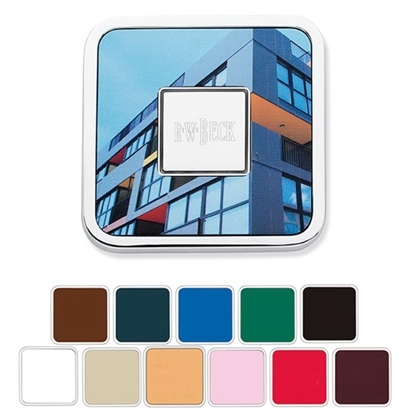 With 11 leather colors to choose from, you need only specify color and coaster finish when ordering. A full color imprint with bleed will be decorated on white leather. These memorable circular coasters measure 3-3/4" diameter x 3/8" H and come in cork, leather and zinc. 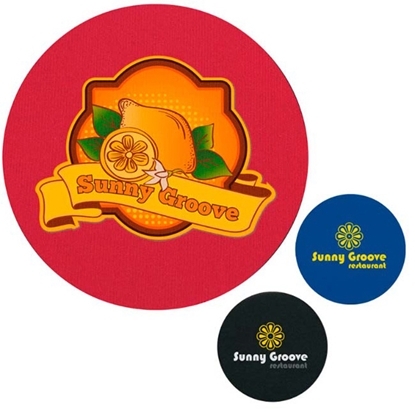 Your corporate logo and message show up brilliantly on the generous imprint surface of these coasters. Order yours now! 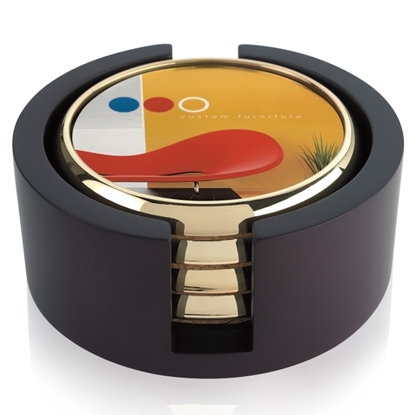 You'll easily "set" your campaign apart with the Lugano coaster set! 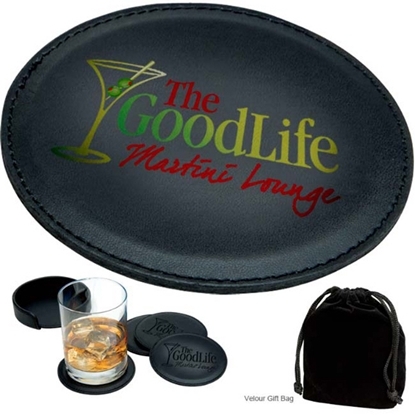 A great addition to any desktop, this leather-like coaster set with a stand comes in an attractive velour gift bag. The coasters measure 3 7/8" diameter x 1/8" d. The holder measures 4 1/4" w x 1" h. The gift bag measures 5 1/4" w x 6" h. This memorable giveaway is perfect for any business or event. Have your logo or message imprinted today! Break open this gift for the next office party! 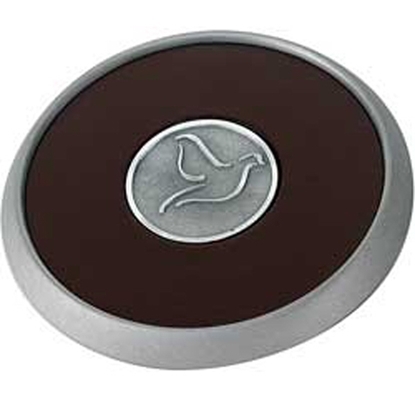 The zinc finish creates a rich accent for the Round Zinc Coaster. Please specify leather color and imprint method. 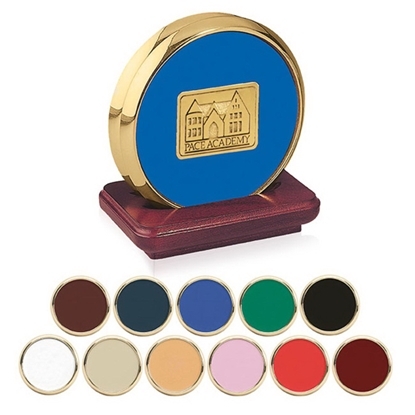 These circular coasters measure 3-3/4" diameter x 3/8" H.
The Round Brass Coasters are manufactured from molded brass over zinc and bonded leather! Please specify leather color when ordering. A variety of imprint methods are available. 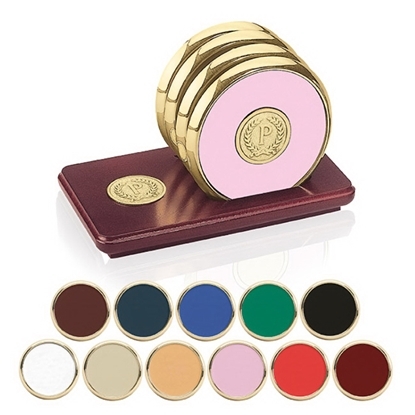 These memorable circular coasters measure 3-3/4" diameter x 3/8" H and come in cork, leather and zinc. Order now! The brushed zinc finish creates a rich accent for this leather coaster! A variety of imprint methods are available to create a recognizable advertisement. Production times: laser engraving, 5 days; screen printing, 5 days; deboss, 7 days; foil stamping, 7 days. A Custom Crafted Medallion takes 20 days. These memorable circular coasters measure 3-3/4" diameter x 3/8" H and come in cork, leather and zinc. Make your statement by ordering now! 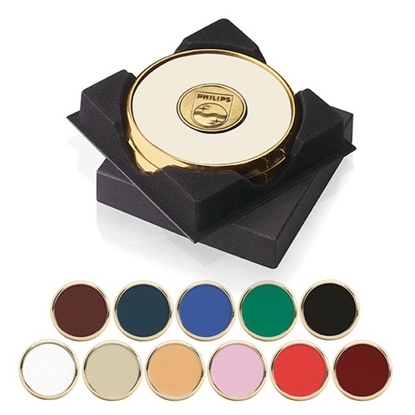 Add a touch of elegance to the boardroom or executive office with our Brass Square Coasters! Please specify leather color and imprint method when ordering. 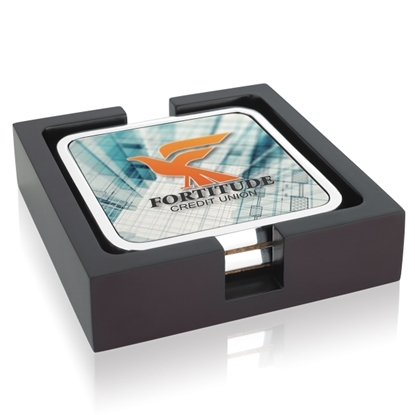 These coasters measure 3-7/8" square x 1/4" H.
Our Zinc Square Coasters add elegance and color to the boardroom or executive office! Please specify leather color and imprint method when ordering. At 3-7/8" square x 1/4" H, these coasters will highlight your next office party! 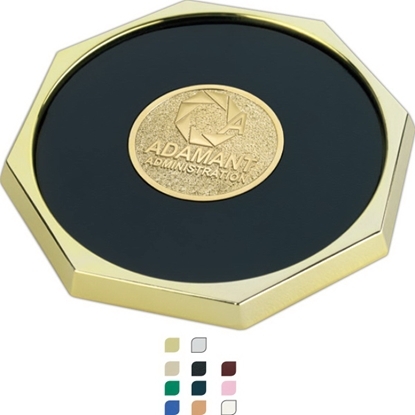 Octagon shaped zinc alloy coaster includes a custom crafted, laser engraved, or screen-printed medallion. Medallion in picture is the QC medallion. 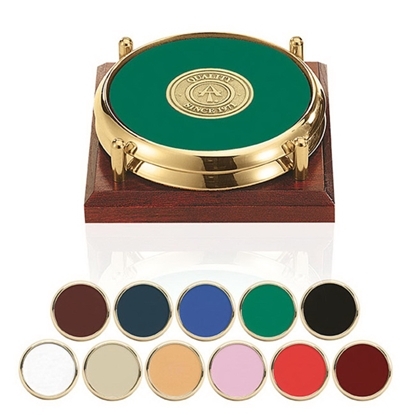 Please specify leather color and coaster finish when ordering. 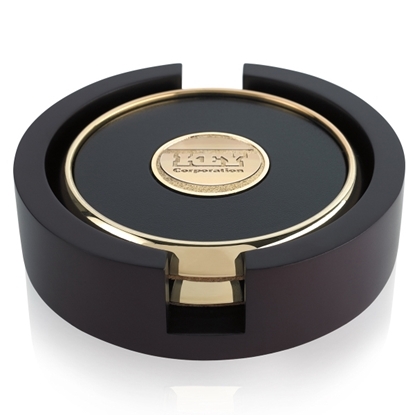 Double the impression you leave with these two brass/leather coasters in a deluxe black flocked gift box! Please specify leather color when ordering. 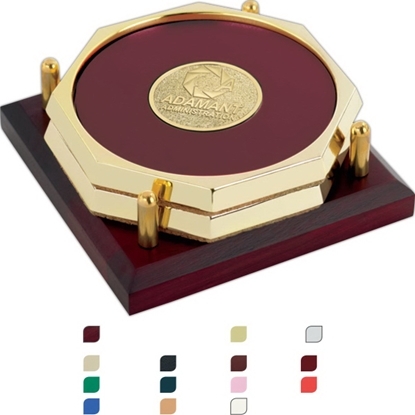 This is shown with the QC Medallion.With measurements of 4-1/4" square x 7/8" H, these elegant coasters will highlight your next office party. Order now! 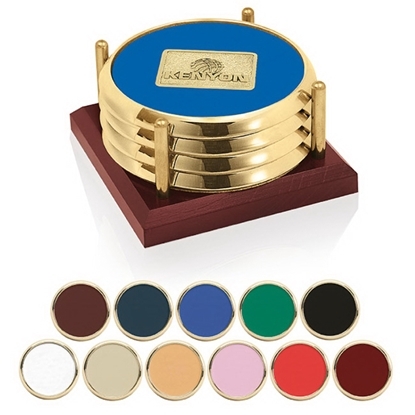 This set of two coasters with solid cherry stand is manufactured from molded zinc or brass and bonded leather. The base is crafted from solid cherry wood. The image is shown with the RQC Medallion. Please specify leather color when ordering. 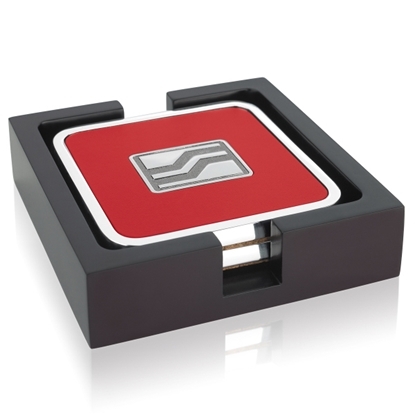 This elegant set measures 3-3/4" W x 4" H x 2-5/8" D.
This item puts your brand name on a firm base! 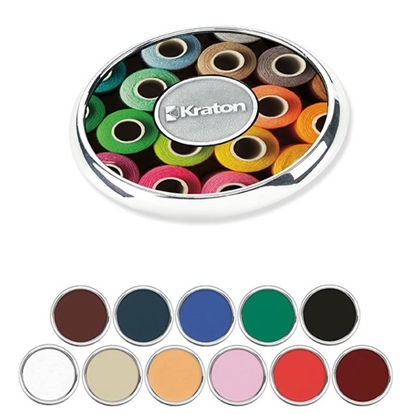 Our Round Stainless/Polymeric Rubber Coast Set features an arched stand that holds 4 round coasters. The image is shown with the QC Medallion. This set measures 3-1/2" W x 4-1/4" H x 3-3/4" D. Be ready for your next office party by ordering now! Decorative and durable, this set of two coasters with its solid cherry tray and columns is truly a "solid" gift! The image is shown with the QC Medallion. With measurements of 4" square x 1-1/4" H, this elegant set will highlight your next office party. Order yours today! Two octagon shaped coasters include a custom crafted, laser engraved, or screen-printed medallion. They're perfect to commemorate any special occasion and come with a solid cherry tray. Please specify leather color and coaster finish when ordering. Medallion pictured is the QC medallion. Set of 2 Square Radiant Coasters with a Wood Tray. Set of 2 Round Coasters with a Wood Tray. Set of 2 Square Coasters with a Wood Tray. Set of Four Round Radiant Coasters with a Wood Tray. This is a beautiful high quality modern gift. Full color imprint with bleed will be decorated on white leather. Please specify leather color and coaster finish when ordering. These four brass and leather coasters look elegant on a solid cherry stand! 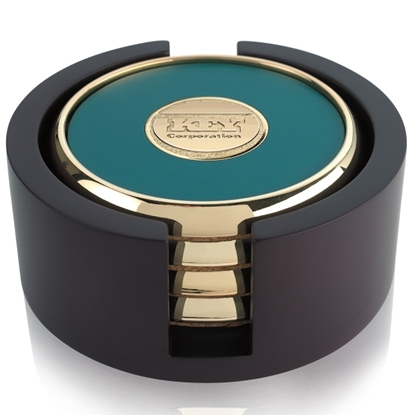 The image is shown with the OC Medallion on coaster with stand included. Please specify leather color when ordering. Measuring 6-1/2" W x 4" H x 3-3/4" D, this set also offers your choice of imprint method. Production times: laser engraving, 5 days; screen printing, 5 days; deboss, 7 days; foil stamping, 7 days; Custom Crafted Medallion, 20 days. Order yours today! 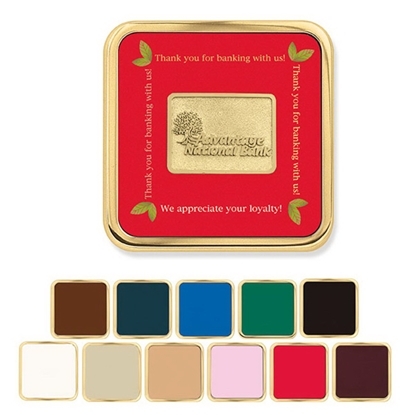 The combination of choices in coaster color, medallion and tray makes this set suitable to every occasion! 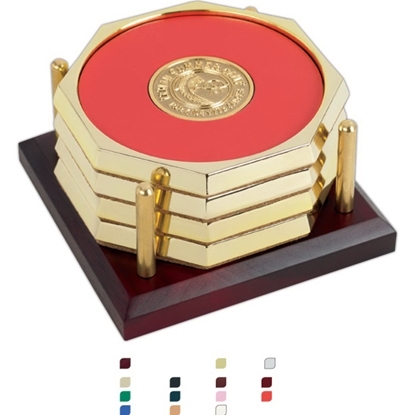 The Four Coasters with Solid Cherry Tray measures 4" square x 2-1/4" H. The image is shown with solid brass columns and QC Medallion on the coasters. What a perfect gift to welcome new customers! Four octagon shaped coasters include a custom crafted, laser engraved, or screen-printed medallion. They're perfect to commemorate any special occasion and come with a solid cherry tray. Please specify leather color and coaster finish when ordering. Medallion pictured is the QC medallion. Set of 4 Square Radiant Coasters with a Wood Tray. Manufactured from molded zinc or brass and bonded leather, this elegant set of four coasters with solid cherry stand measures 3-5/8" W x 4" H x 3-5/8" D. The base is crafted from solid cherry wood. The image is shown with the RQC Medallion. Please specify leather color when ordering. Order yours now! Our set of four round coasters with black acrylic tray. 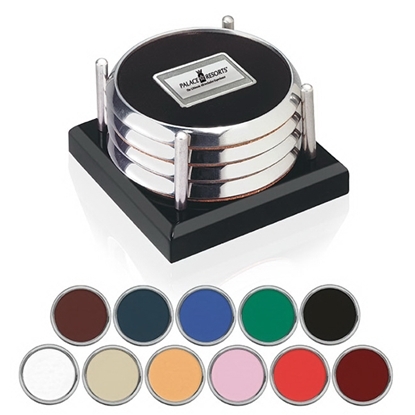 Coasters are manufactured from molded zinc or brass and bonded leather. 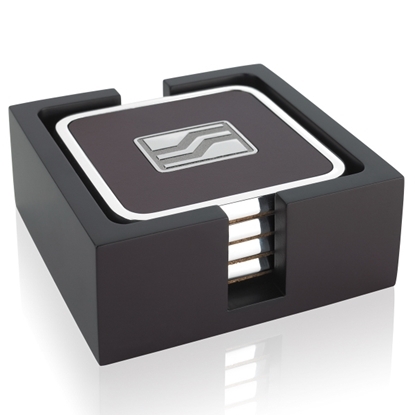 The square base is crafted from black acrylic. The image is shown with the RQC Medallion. Please specify leather color when ordering. The set measures 4" square x 2-1/4" H.
Set of 4 Round Coasters with a Wood Tray. Set of 4 Square Coasters with a Wood Tray. 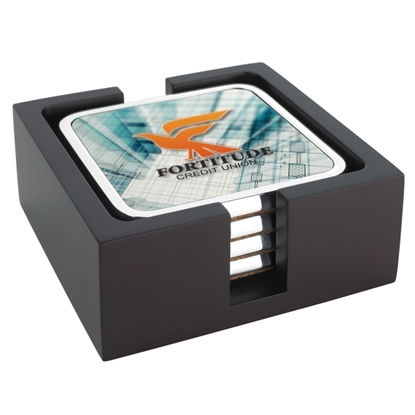 Exhibit your corporate excellence with our high-quality Dymondwood (TM) Four-Coaster Tray set! This gift is a great way to welcome new staff members or new customers. The image is shown with the QC Medallion. Please specify leather color when ordering. The set measures 5-1/2" W x 1-3/4" H x 3-3/4" D. Production times: laser engraving, 5 days; screen printing, 5 days; deboss, 7 days; foil stamping, 7 days; Custom Crafted Medallion, 20 days. This solid cherry chest holds four brass-plated coasters. Chest and coasters have the same medallion. Each piece is made of a naturally occurring material; slight variations may be present. 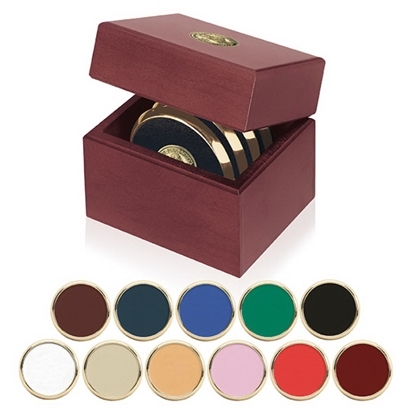 Please specify brass or zinc coasters and leather color when ordering. Dimensions are 5-1/2" W x 4-7/8" H x 4-7/8" D.
Mypromotionalpens.com offers the largest and best priced selection in Promotional Coasters. We will price compete and we won't be under sold. Let our graphic designers make your personalized Coasters standout above the crowd at no charge. We won't stop until you are completely satisfied with your custom Coasters art proof.Use category search filters on your left to help narrow your search to find exactly what you are looking for.